This tool checks if the entered credit card numbers conforms to the Luhn formula (MOD 10 check). Multiple credit card numbers can be checked at once. In the input field enter each credit card number on a separate line. 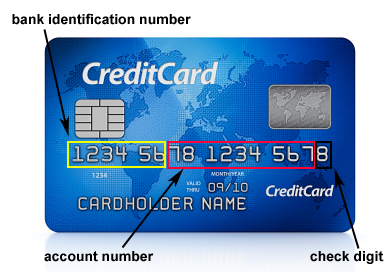 The credit card numbers can only contain numbers, spaces, dots (.) or dashes (-). The first six digits is the bank identification number (BIN) or issuer identification number (IIN) to identify the issuer of the card. The number between the bank identification number and the check digit is 6 to 9 digits long and is used to identify the individual account number. The credit card information provided are not guaranteed to be correct, as they may not be current and, although the information is provided in good faith, Mobilefish.com is not in a position to check its validity. Do not use fake credit card numbers in any production system. If you do, you may end up in jail or get a fine. Web shops monitors bounce credit cards and your IP address and shipping address are used to trace you. Enter the credit card numbers each on a separate line.